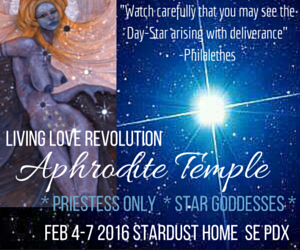 For the 2nd year in a row the LLR Winter Temple will be available only to people already enrolled in the LLR Aphrodite Temple Priestess Training program. The theme of the Temple is the morning star: Venus and the focus of the work will be engaging Priestesses in leading sections of the Temple they need to learn in order to lead Temples on their own in the future. There will be a deep focus on trance work and deity channeling at this event. Chanting, drum work and anchoring as well. The cost of this Temple is $150-$300 sliding scale. Here is the Registration Link .You can call me at 206-612-3511 to discuss payment plans. Registration will close on Jan 25th at Midnight. Many Blessings!